You find yourself in a huge room where you hear someone say "Check!". In the center of the room a hologram is running, showing a line of people of different nationalities taking turns walking to alternate sides of a chess board, making a move, then notating it on a piece of paper lying by the board. You watch them make nine moves. At that point the players look at the piece of paper, nod their heads, and shake hands all around. Most of the players walk off and disappear from the hologram, but one of the last nine stops the other eight and says, "Perhaps we should say something about those last nine moves." Each of them in turn faces whatever camera took this image, thus facing you, and makes a statement about the last nine moves. Then they leave, and the camera zooms in on the board, which comes into sharp focus in the position given below. The Albanian: "I made the longest move." The Romanian: "Another player moved the same piece I did." The Korean: "I made a move to a rank not moved to by any other player." The Swede: "I made a move from a rank not moved from by any other player." The Italian: "I moved a piece so that it ended up on a file to the right of where it started, from white's point of view." The Turk: "I moved a piece so that it ended up on a file to the left of where it started, from white's point of view." The Basque: "I moved a piece so that it ended up on the same file that it started on." The Estonian: "The Basque and I moved pieces to the same diagonal." 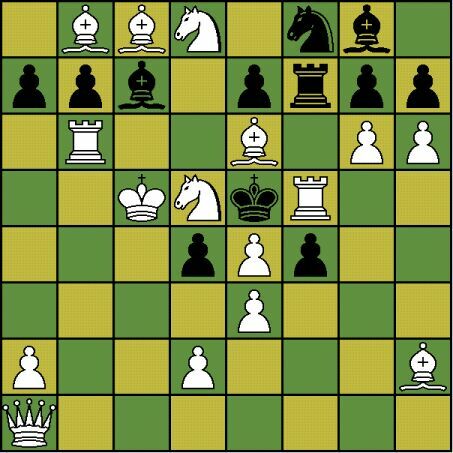 The Burmese: "The Estonian and I moved pieces to the same rank."